WITH SONGS LIKE: ALL THAT JAZZ, PROUD MARY MARY, I LEFT MY HEART IN SAN FRANCISCO, FEELIN' GOOD, NOT WHILE I'M AROUND, PIANO MAN, CONGA, THE BEST IS YET TO COME, WHEN THE PARADE PASSES BY, WIND BENEATH MY WINGS, FEELIN' GROOVY, YOU ARE THE SUNSHINE OF MY LIFE, BEAUTIFUL, LOCO-MOTION, NINE TO FIVE, WHEN I'M SIXTY-FOUR, and MORE!! A CELEBRATION OF AGELESS LEGENDARY PERFORMERS WHO ARE STILL HOT! Like Dolly Parton, Chita Rivera, Carole King, Bette Midler, Tina Turner, and Gloria Estefan, just some of the performers celebrated in her brand new show, nothing keeps Naomi Miller down! For her show, Naomi has invented the word “schmaging” to define performers who are aged sixty and above and who are still going strong, still hot, and still got what it takes. 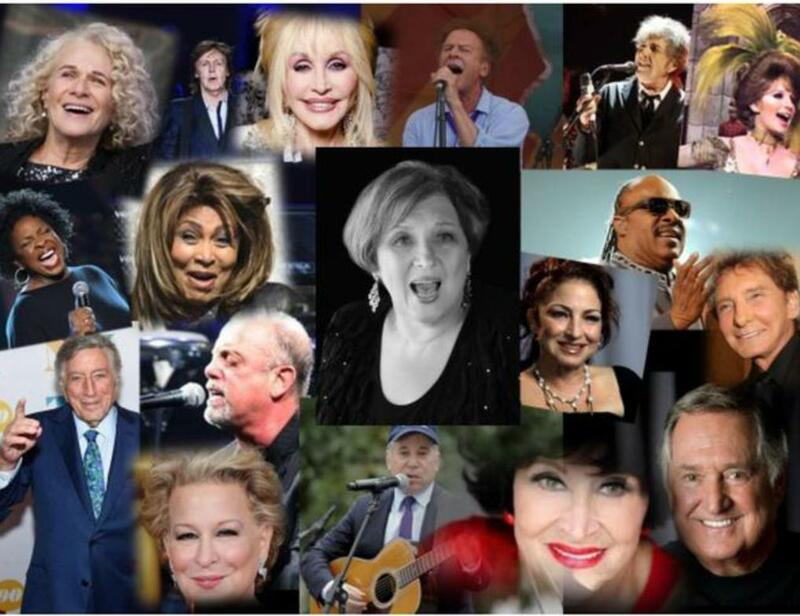 In addition to the divas, Naomi also sings the songs of the divos – Tony Bennett, Paul McCartney, Billy Joel, Stevie Wonder, and Neil Sedaka and also celebrates schmaging with some original and Broadway tunes. Weaved into the act is another theme – one about fulfilling the items on your bucket list. Just as an example, Naomi’s bucket list includes riding along the shore on a white horse – but the horse has to be her age. To get a glimpse into this new show, click here. Here are just a few comments made after the show premiered! “ Fabulous show, lots of laughs and great singing! Kudos to Naomi and Harvey Miller for producing this masterpiece!”-Esther D. “Your stage presence is fantastic. You’re a true performer!”- Linnae G. “Hilariously funny”- Sharon N. “Unbelievable, fantastic, tremendous performance. I’m speechless!”-Dr. Dov G.
Three scenes from the PowerPoint that accompanies "Aging / Schmaging"